Wow, 2015 was a year to remember! Here’s to many more parties like this one in 2016, filled with lots of sweating, giving, mingling, and smiling. 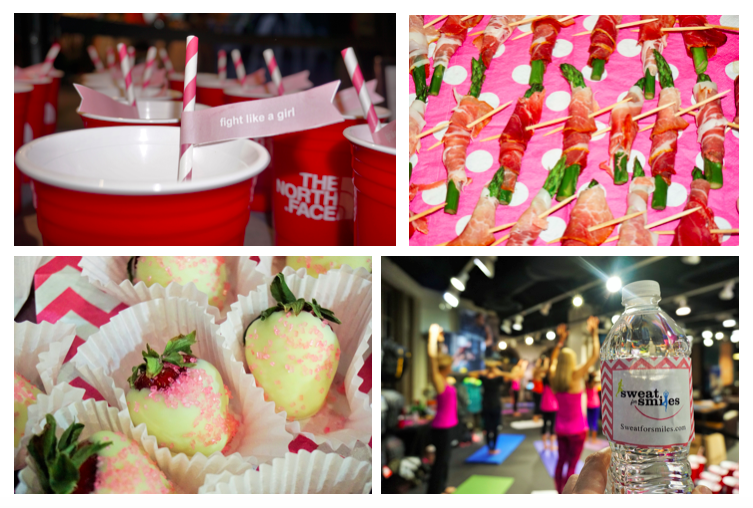 So, our Pink Ribbon Pilates Party ROCKED! In case you couldn’t make it, we have all the details. 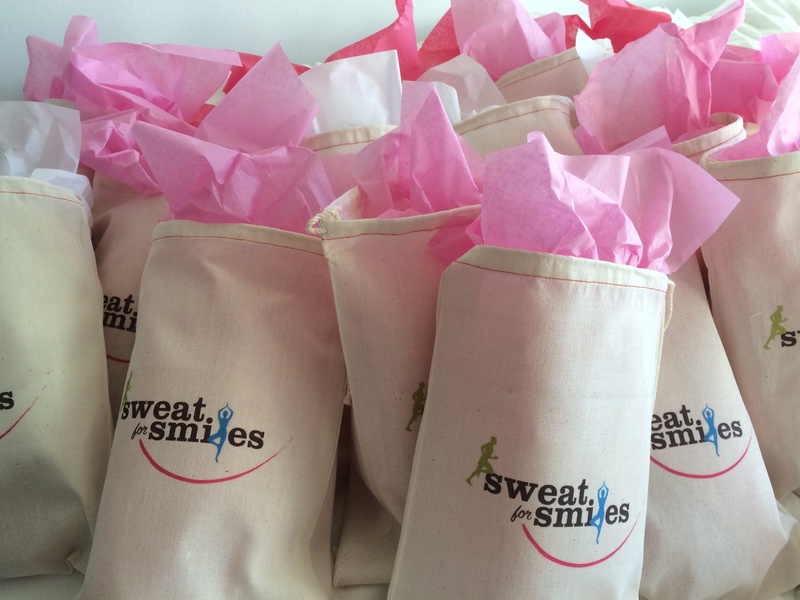 Plan It: We designed an online Paperless Post invitation and sent it out 3 weeks prior to this Pink Ribbon Pilates Party. The invitation announced that the party would include a “Pink Ribbon Pilates” class from celebrity instructor Kristin McGee, cocktails and more with donations optional to Boarding for Breast Cancer (B4BC). B4BC promotes “early detection and a healthy, active lifestyle as the best means of breast cancer prevention.”. We feel it ties in well with Sweat for Smiles because of it’s origins in the action sports community. Cook It: Before and after the Pink Ribbon Pilates workout, guests nibbled on Prosciutto-Wrapped Asparagus and Pink-Sprinkled White Chocolate Strawberries. Pink was everywhere! “The Pink Ribbon” Cocktail and custom Sweat for Smiles water bottles quenched our fitness enthused party guests as they mingled and took a look at The North Face’s Mountain Athletics line. 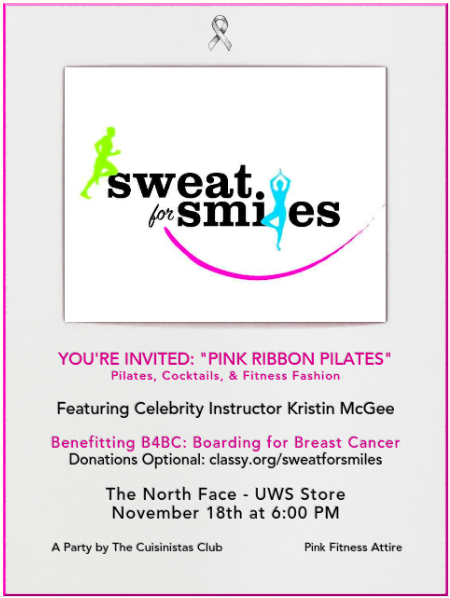 Work It: I’m thrilled that celebrity instructor Kristin McGee partnered with us again for the Pink Ribbon Pilates party. Kristin has been teaching pilates since the 90’s and is your go-to gal for a strong and sleek mid-section! She has been on the cover of 3 pilates style magazines has two top-rated pilates plans available on Cody and her own app titled “Yoga and Pilates with Kristin McGee” available on iTunes. Create It: After Kristin McGee’s awesome Pink Ribbon Pilates workout, the fitness fashion enthusiasts participated in “Sweat & Shop”. 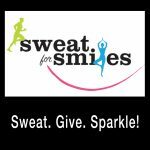 Thanks to The North Face, 20% of the proceeds from the Sweat & Shop were donated to B4BC. The event culminated with the long-awaited drawing for winners of the raffle. As an additional thank you for guests support, the tickets had been awarded at entry to the party. 4 lucky winners were THRILLED to win awesome prizes from The North Face, Vira Sun and Fashletics. Style It: Kristin and I were thrilled to have the opportunity to try out The North Face’s Mountain Athletics line. Just like their outdoor apparel, we found the pieces were very high quality and comfortable, and they fit us really well. The North Face put together a really stylish outfit for both Kristin McGee and myself. As active moms, we have been wearing our The North Face Mountain Athletics gear both in and out of the gym since we got everything! Wish I could have gone. I love my North Face workout shirt!